Jodi Smith lives on 27 acres of woods and stream in western Maine, near the White Mountains. 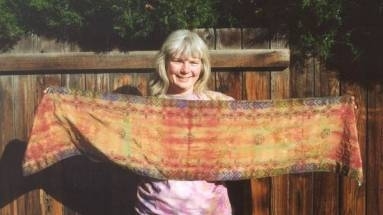 Jodi spins, weaves, dyes, knits, and decorates eggs. She is a former officer of the Northern Colorado Weavers’ Guild, and a former member of the Society for Creative Anachronism, a medieval living-history group. She has recently retired from raising dairy and Angora goats and Churro sheep, but still has chickens and heirloom turkeys. Her ancestors came to America from Lusatia (now in Germany) in 1854, on the sailing ship Ben Nevis, hoping to protect their Slavic language, culture, and religion. Jodi’s mother, the second generation born in America, also decorates pysanky eggs. Jodi’s daughter made her first pysanka egg when she was 5. Jodi graduated from the California Institute of Technology in 1976, with a degree in Chemical Engineering. Jodi’s background in chemical engineering, and her interests in fiber and in medieval life all lead to her work with natural dyes. Medieval Dyes, based on her own experimental research, is her first book. Jodi’s husband has a job with a real paycheck, but he still finds time to help fix the pasture fences. Their daughter loves playing with the dog, and hates homework and cleaning her room. Within the Society for Creative Anachronism, Jodi is known as Mistress Drahomira Jaroslavna. She is a member of the Order of the Laurel, and resides in the Province of Malagentia, in the East Kingdom.